Bluestone's Derringer Ankle Holster is the concealment option you didn't know you needed until it was available. People tend to carry a lot of different things inside of their pockets, and the last thing you need when reaching for your firearm is a delay in draw speed. By concealing your Derringer on your ankle, there's nothing else in your way so you can have the upper hand. Our ankle holster fits most .22, .25, .32 North American Arms' Derringers. 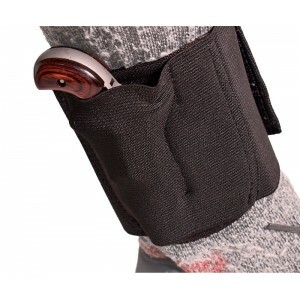 The quality elastic used for this holster breathes as you move, so it isn't constricting or too warm in the summer. Plus, the Velcro firmly holds the holster on your leg while the Valera foam padding makes it comfortable to wear. The quality craftsmanship and materials used for this product set it apart from the competition and give you peace of mind as you wear conceal your firearm throughout the day. Keep protection within reach! Proudly Made in the USA! I bought this to conceal my backup gun a .380 curve. The gun fits snug. Holster stays in place and remains comfortable. It can not be noticed under jeans. This holster was shipped and arrived very quickly. It holds my mini 22LR revolver nice a snug. It is very comfortable around my leg. I wore this around the house the first night I got it and when I started to change for bed I actually had a "oh wow" moment when I had forgotten I had it on. I wear high dress socks and wrap this around the top of the sock so that aides in making it not noticeable when wearing. I wear mine on the inside of my left leg rather than outside of my right (right handed shooter) as I feel there is little to no chance of accidental printing if my pants ride close to my outside leg for any reason. The only downside is it is so comfortable you may forget about your gun being there but just have to be smart about it. Fits snugly and comfortably. Works as advertised.